William Smiley, a representative farmer of Wayne Township, Lawrence County, Pennsylvania, and a veteran of the Civil War, was born in that township, just south of his present residence, in 1835, and comes of one of the pioneer families of the county, on both sides of the house. He is a son of William and Ellen (Gallagher) Smiley, both of whom were of Irish heritage. 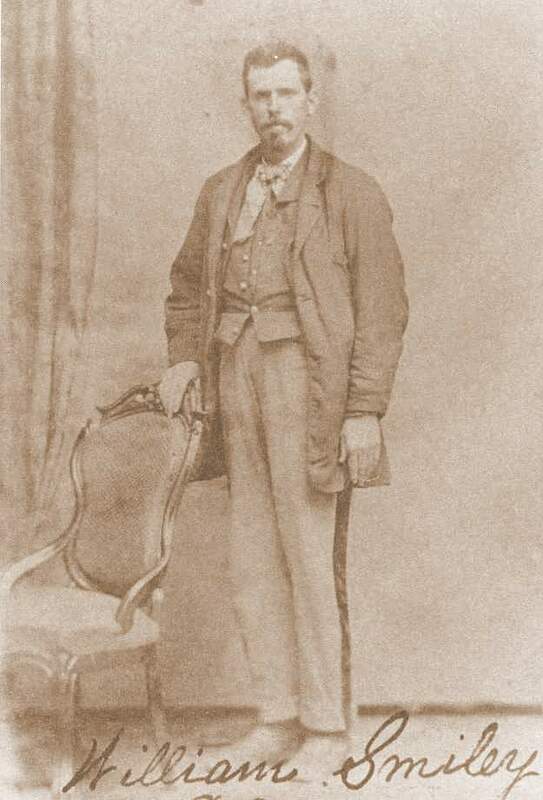 Hugh Smiley, grandfather of William was born in Ireland and emigrated to this country in his younger days and purchased land in Wayne Township, Beaver (now Lawrence) County, Pennsylvania, where he was among the earliest settlers. He had five sons: William; Hugh, who lived in Illinois at the time of his death; Boyd, who also moved to Illinois and lived there at his death; John, who remained in Lawrence County; and Andrew, who died in Beaver County, Pennsylvania. William Smiley, Sr., was born in Wayne Township, and was there reared on his father's farm, which he aided in clearing. He married Ellen Gallagher, who was born near Prospect, in Butler County, Pennsylvania, and they became the parents of nine children, as follows: John, who married Lizzie Newton, was a member of Company A, Seventy-sixth Regiment, Pennsylvania Volunteer Infantry, during the Civil War, and died at Hilton Head, South Carolina; William, Jr.; Margaret, wife of Frank Ford, lived and died in Wayne Township; Martha, wife of Amos Pyle, died near Prospect, Butler County; James, who died in 1907, married Isabella Work; Catherine married Dewise Cunningham of Wurtemburg, now deceased, who was a surgeon in the army during the Civil War; Clarina, wife of William Wallace, lives at Mahoningtown; Thomas J., a resident of Hazel Dell, married Miss Christina Newton; and Albert, the youngest of the family, died at the age of three years. William Smiley was reared on his father's farm and attended the public schools of that district. He learned the trade of a blacksmith in his youthful days and worked at it until he joined the army. He enlisted in August, 1861, in Company C, 100th Regiment, Pennsylvania Volunteer Infantry, and was mustered in at Pittsburg. The regiment went to Washington, D.C., thence to near Beaufort, South Carolina, and from there to Charleston. Returning to Beaufort, it embarked for Fredericksburg, and from the latter place went to Bull Run, where it participate in the second battle of that name. The next battles in which Mr. Smiley participated were South Mountain and Antietam, after which the regiment returned to Fredericksburg, and from that point was sent to Kentucky. This regiment continued westward to Vicksburg, where its members participated in the siege of that city, then returned to Lexington, Kentucky, thence to Knoxville, Tennessee. At the latter place Sergeant Smiley's term of enlistment expired, and he re-enlisted at Blaine Cross Roads for the remainder of the war. He went home on a thirty days furlough, rejoining his regiment at Pittsburg. From there they went to Washington and joined the command of General Grant, under whom they served during the remainder of the war, and Mr. Smiley took part in the battles of the Wilderness, Coal Harbor, and the engagements about Richmond and Petersburg, until General Lee's surrender at Appomattox Court House. The regiment then returned north and was mustered out at Harrisburg, Pennsylvania. Mr. Smiley was for three years color bearer with the rank of sergeant, and was advanced to the rank of second lieutenant. During his service of three years and eleven months he was never off duty for sickness, and was injured but once, that being a slight wound on the back of the head which left him stunned; the captain seeing him motionless upon the ground thought him killed. Upon his return from the front, Mr. Smiley resumed work as a blacksmith, at Wurtemburg, where he continued five or six years, then went to Wampum where he was employed as blacksmith for the Wampum Furnace Company for a period of eleven years. At the end of that time he purchased his present valuable farm of sixty-seven acres of his uncle, John Smiley, and has lived here continuously since that time. An energetic and progressive man, he has made his way in the world solely through his own efforts and the aid of a faithful wife. He has made many improvements upon the place, and in 1891 erected the comfortable home in which he now lives. Enterprising and public spirited he enjoys the respect and esteem of his fellow citizens to a marked degree. In 1863, while home on furlough, Mr. Smiley was united in marriage with Miss Nancy Morton, a daughter of James B. and Jane N. Morton of Lawrence County. They had six children, four of whom are living, as follows: William, who married and lives in Pittsburg; Robert, who married and lives in Ellwood City; Ona, wife of T.J. Bracken; Ellen, deceased wife of George B. Nye; Lizzie, who lives with her parents; and Albert, deceased. Religiously, Mr. and Mrs. Smiley are members of the Slippery Rock Presbyterian Church. He is a Republican in politics; and a member of Wampum Post, No. 381, G. A. R.